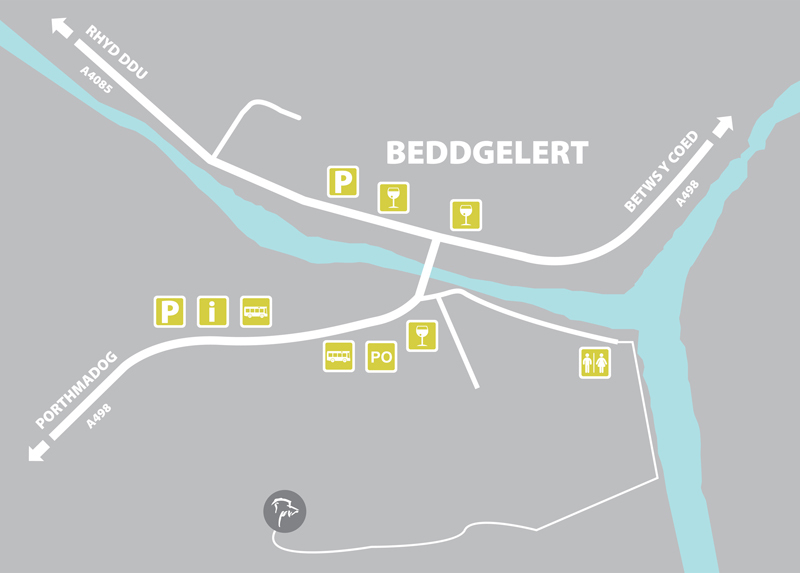 To help plan you stay we have put together this map of Beddgelert so you can familiarise yourself with the area and our amenities. Whether you need cash or just want an ice-cream you’ll find it in the village! Click on the map to download a large printable version in PDF format. Post Office: the Post Office is located within Emrys House general store. Cash: cash withdrawal is available for no charge in the Post Office. Tourist office: there is a Tourist Information Centre in the village. Car parking: there are 2 main car parks within the village, either side of the river see map for further details. Public toilets: there are good modern public toilets in the village including accessible toilets which require a RADAR key. Petrol / diesel: The nearest petrol stations are Porthmadog (9 miles) or Betws y Coed (12 miles). Porthmadog or Betws y Coed. Internet / WiFi: a lot of accommodation will offer internet / WiFi, but if not access to the internet can be found in the Tourist Information Centre for a small charge. A level bridge, away from the main road, near to the school links both sides of the village and is wide enough for wheelchairs and pushchairs. Several of the hotels, guest houses, shops and cafes are accessible; please check the individual listings on this web site or contact us for further guidance. The Tourist Information Centre in the village can also provide guidance and advice. There are accessible public toilets in the village which require a RADAR key. A riverside path, Gelert’s Trail which is owned by the National Trust has been made more accessible. Printed from the Beddgelert Tourism Association web site on 23/04/2019 15:33. Information correct at time of printing.